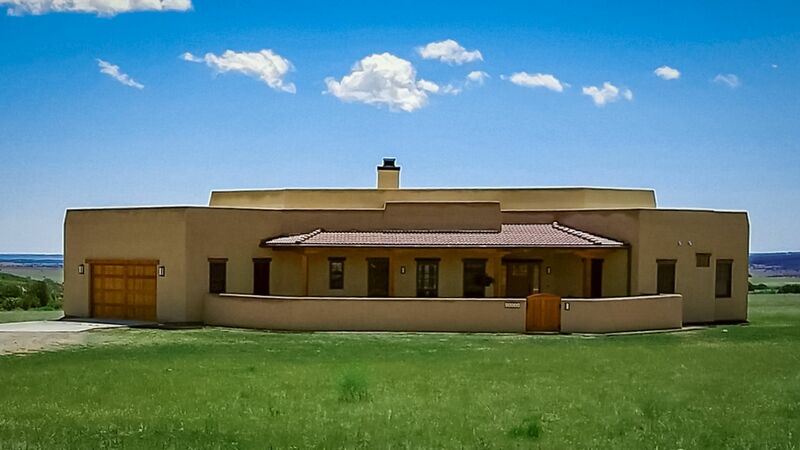 A beautiful Santa Fe style ranch home in the Lago Vistas neighborhood. Upscale features include: 9 and 10 foot ceilings, red oak hardwood floors, tiles with a white washed hardwood look in bathrooms and laundry, solid six panel doors, barn style slider doors on half bath and pantry, brick wood burning fireplace, Anderson wood casement windows with Hunter Douglas blinds, sliding doors out to back patio from family room and kitchen and master bedroom, quartz counter tops, custom butcher block counter with farm sink in laundry, large covered porches in front and back with tongue and groove wood ceilings, walled courtyard with lawn in front, oversize 2 car garage, neighborhood allows guest house or barn, horses allowed, greenbelts through out neighborhood, 2 minutes to Holly Dot golf course and Lake Beckwith. For more photos see greenhornbuilders.com.